The LLama Butchers: ?????? !!!!! I am amazed that the McCain camp has been so disciplined about keeping the lid on his pick for VP. But I am also getting excited about the growing buzz around Sarah Palin. If she is, indeed, his choice, I would call that one wicked awesome decision. 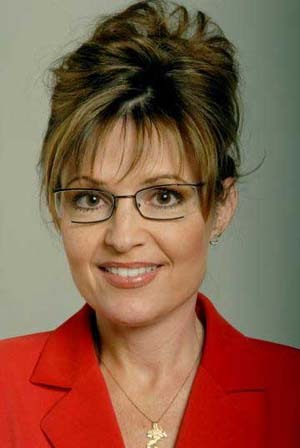 UPDATE: Well, I didn't see Palin's acceptance speech just now but the Missus did. And if she's any indication of the Country's mood, this choice is positively brilliant. Holy crap, I actually got this one right! I'm speechless. I never thought McCain would go for it. I'm so glad he did. After a campaign season that was such a yawner, this really kicks it in the pants. I heard two interviews she did with Glenn Beck a couple of months ago and I was very impressed with Palin. She's a solid conservative, articulate with a great grasp of the issues. I was very excited to hear that she may be the pick this morning. I think she's a brilliant choice and will really help McCain as we head for the home stretch. My only fear - she's not well known so the press will hunt for anything on her. I hope she was well vetted by the campaign. And a prolife woman. Well played, Sen. McCain. And she has more experience than Obama. Gary, you're the man. Your post was the first I ever paid attention to her, and i went from there to her website and all. Nicely done. (I had been betting on Kay Bailey Hutchinson). The more I read, the more I am impressed. A multidimensional pick that solves a lot of problems for McCain and adds some for Obama. Her husband is a pretty neat guy, too. Four time Iron Dog snowmobiling champion. I have a tingle... At least I won't have hold my nose quite so hard when pulling the Republican lever. As one blogger wrote--"She has the integrity of Harry Truman and the Balls of Magaret Thatcher". So now we may see - What is True. What is Right and What is Just. Gary, after you got me all excited for George Allen I stopped listening to your picks, but I have to admit you nailed this one.